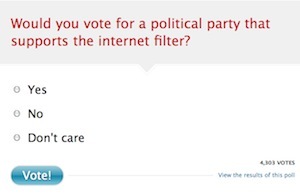 Sorry, this is really for Australian readers only: a large number of Australian media sites are running a common poll on the proposed internet filter. Sure, it’s a very simple question, and there’ll no doubt be some debate over its wording, but it really has one intention: to get a idea of wider community perceptions of the issue. The majority of the tech community are arguably against the filter, but it goes without saying that’s a specialised cohort of people. So if you have an opinion, or have family / friends to whom tech primarily means the microwave they heat their cup of tea up in, then put in your two cents worth. Click on the poll image above or go here to have your say.